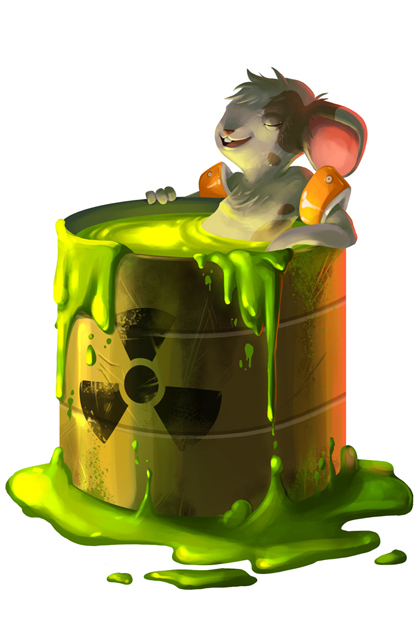 The Sludge Soaker Mouse is a breed of mouse found in the Toxic Spill, for hunters of rank Lord/Lady and above. This is the kinda guy that likes to "go with the flow" of things. One of the first to come to accept the pollution, the Sludge Soaker Mouse can be found relaxing about and enjoying his new habitat. Partial to the warm, glowing feeling that fresh toxic ooze provides, he figures why fight it? Sludge Soaker mice are especially attracted to Rancid Radioactive Blue cheese, to the point that any other kind of cheese will simply not suffice. Hydro type traps such as Oasis Water Node Trap or Phantasmic Oasis Trap are effective against the Sludge Soaker Mouse. The Sludge Soaker Mouse drops the Toxic Spill Egg during the annual Spring Egg Hunt.